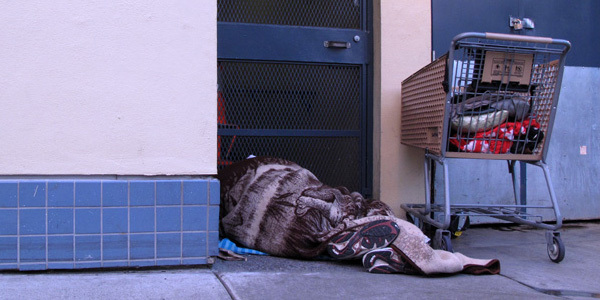 A man sleeps in a doorway on Caledonia Street, just around the corner from businesses on 16th Street. In 1972, an enterprising young reporter named Geraldo Rivera clandestinely recorded appalling footage at the Willowbrook State School, a New York psychiatric institution. Nearly 50 years later, psychiatric hospitals such as these no longer exist, in part because of the horrific conditions exposed by Rivera’s camera. And yet the status quo (like Rivera and his shtick) has not aged well. Now a journalist — or a politician or a tourist — doesn’t need to break into a mental hospital to record damning videos of men and women unable to care for themselves living in filth, squalor, and misery. She can just wander down Mission Street. With an eye toward this, Supervisor Rafael Mandelman this week introduced an ordinance that would expand the city’s ability to place mentally ill people into conservatorship — that is, institutionalize them, against their will if need be — and appoint a “conservator” to mind their affairs. This is the local enabling legislation following Sen. Scott Wiener’s statewide efforts, which resulted in the passage of SB 1045 in September. That is not a lot of people. And yet, for opponents of this approach, even that is too many. But, at this point, perhaps it’s worth looking at who qualifies to be remanded into conservatorship via Wiener and Mandelman’s bills. There are a great number of qualifications, and a person must meet them all. First, you must be mentally ill. You must also be addicted to drugs (prior conservatorship laws only covered alcoholism, meaning chronic inebriates could potentially be institutionalized, but not drug addicts). You must also have been detained for evaluation and treatment via a police 5150 order eight times or more in the prior 12 months (A judge needs this new stipulation, Wiener says, to more fully evaluate the totality of a person’s condition rather than merely gauging how they behave during a brief courtroom appearance). But wait, there’s more: If you’re a mentally ill drug addict who’s been 5150’d eight or more times in the recent past, before applying the conservatorship enabled by SB 1045, the city must also attempt to put you into assisted outpatient treatment. If that works out, SB 1045 won’t be evoked. But if the city fails to get you into that program, or you fail out of it, you could qualify for conservatorship under the new Wiener/Mandelman legislation. After all that, a judge must rule that there is not a less severe course of action the city could take; the judge must essentially rule that assisted outpatient treatment is insufficient. All of these conditions must be met; all of these boxes must be checked. And yet, opponents of this legislation are not reassured. Jennifer Friedenbach of the Coalition on Homelessness testified against it in Sacramento. Police, she notes, are not mental health professionals, and they may impose 5150 detentions spitefully. Jessica Lehman of Senior and Disability Action felt SB 1045 and its San Francisco enabling legislation are poor choices in terms of resources. Why force drug addicts who’ve been 5150’d eight times into treatment — when there’s no money to fund voluntary treatment for people who actually want to quit? So, in a nutshell, nobody is happy. Everybody is angry. And the conditions on our streets are still Willowbrook State School circa 1972. Mandelman, however, feels we can change that. Ever so incrementally. Jennifer Friedenbach is and has been so far beyond the reasonable spectrum of sound policy that she should be irrelevant. Clearly something more has to be done about the dozens of obviously delusional mentally ill that we as San Franciscans see on a daily basis. The conditions imposed on this legislation already constrain it enough to the point where it will be virtually ineffective and even that is not enough for JF? We can not continue to let far-extremists exert an outsized influence on our city politics… after all, look at there it’s gotten us so far. It’s at least a start in the right direction — no need to make the perfect the enemy of the good. Start here, build on it, learn how to do it well, expand it in the future. The current policies and programs SF has been using for years have not worked. It’s time to try something new. This is it. The members of the SF Homeless Industry will be against anything new that doesn’t cost billions of $$$. We know that conservertorship is a seriously flawed system that is known for barbaric exploitation. The question is–will private companies be climbing on the bandwagon along with agencies to milk federal benefits subjected to intergovernmental transfers which end up never used for the original purpose? We know that nursing homes are having huge problems with Medicaid funds not going to staffing and quality of care, but into profits for shareholders and into state coffers. We know that the foster care system takes benefits that are intended for children and uses them elsewhere. This is similar to the privatization of the prison system. These systems sometimes work, but perverse incentives have turned dreams into nightmares for the people who are supposedly under state “protection.” Until California reforms conservatorship laws by adopting the new uniform laws developed over the past two years by the ULC, dont expect any pollyanna results. This will be a nightmare. Have a walk down Minna Alley. THAT is a nightmare. Turning the same insane (in the clinical sense) characters back onto the streets, day in and day out, is not only cruel to them but also to the rest of the citizens in San Francisco. Condemning a program before it starts because of some perceived future problem helps no one. Most importantly the people who need it. Generally, if this plan doesn’t satisfy anyone, I imagine it will be pretty good.